Death is a concept that has left itself open to many interpretations and reactions. To some, it’s the unshackling of the chains of responsibility. To some, it is merely a journey into the unknown. Some react to it by unleashing a torrent of grief, some pragmatically and some take their own time to process the loss. Akarsh Khurana’s second directorial effort after the stoner comedy High-Jack attempts to give us a glimpse into the lives of 3 individuals, all dealing with their own definitions of loss, but the question is, does it translate into a satisfactory cinematic experience? Avinash (Dulquer Salman) is a software engineer leading a robotic life in Bangalore, till the death of his father in an accident shakes things up for him. In an unfortunate mix-up, his father’s corpse ends up reaching Kochi, while the corpse of a Kochi hotelier’s mother ends up with him. A sympathetic friend, Shaukat (Irrfan Khan) decides to accompany him to Kochi in order to sort out the confusion, and on this journey, they are joined by the hotelier’s daughter, Tanya (Mithila Palkar), who herself is grappling with teenage angst and acts out by rebelling against societal norms. As they bond during the journey which also involves gate-crashing a wedding, unexpected encounters with love, past and future, and Shaukat escaping the clutches of a moneylender’s henchmen, can the 3 unlikely travellers confront their inner conflicts, and shake off their emotional baggage to make a fresh start? The first thing you notice about Karwaan is how it makes a conscious attempt at keeping the storytelling low-key and about the characters than anything else. Each character is introduced with the least bit of fuss, and the writing for the most keeps things simple, and lets the audience read between the lines by eschewing the usual expository techniques. The writing however is rather lightweight at times, and relies too much on the charisma of its leads and the warm camaraderie between them, especially in a couple of lazily written scenes that end up coming across as xenophobic. But apart from this and a first half that attempts to be too irreverent at times, the audience manages to stay involved. DOP Avinash Arun, who’d directed the poignant Killa a few years back, is one of the stars of this movie, his camera capturing the sanitized environs of Avinash’s office in Bangalore, the serenity of the hills, and the old school flair of Kerala with panache. Add to that, the fantastic soundtrack by multiple composers, the pick of the lot being Chota Sa Fasaana, Heartquake and Kadam by Anurag Saikia and Prateek Kuhad respectively, complement the screenplay beautifully. Irrfan Khan is in top form as the rakish Shaukat, and plays to his strengths with his motor-mouth dialogue delivery keeping the audience giggling from start to finish, while also pushing back gears to express his long repressed angst over his past. Dulquer Salman puts in another fine performance here, and portrays the caged nature of Avinash’s life without a single false note. It isn’t easy to be noticed in a restrained performance while sharing the screen with livewires like Irrfan and Mithila, but there are certain moments from his performance that will stay with the audience long after the movie is done. Mithila Palkar, who has been making a mark for herself through some charming web series and a career-making performance in the Marathi hit, Muramba, does a fine job here and wins over the audience with her endearing screen presence, in spite of a slightly uneven characterization. Amala and Kriti Kharbanda show up in cameos and light up the screen with their endearing presence. 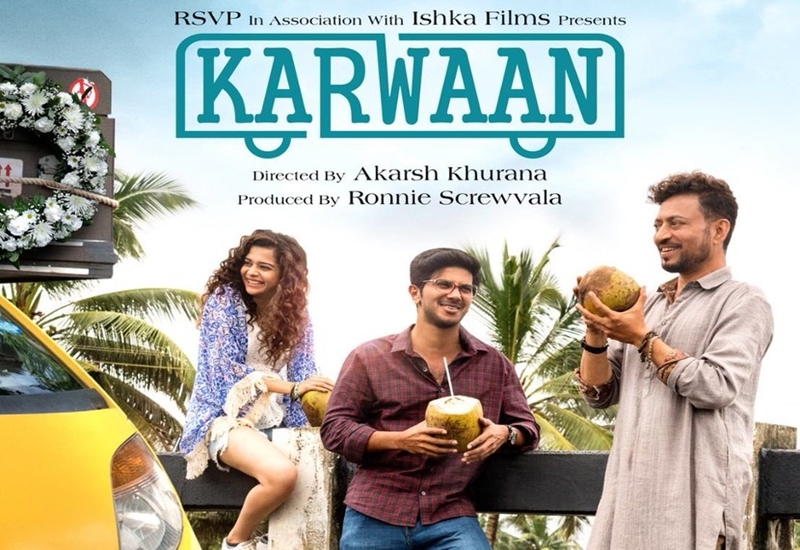 To sum it up then, Karwaan starts out as a black comedy of errors, but slowly and surely evolves into a beacon of warmth, that will make sure you walk out of the theatre with a big smile on your face.